The Central District, which contains Moscow, is in the stretch zone, exclusively. Stretch zones are not exempt from earthquakes, as there are jolts when rock pulls apart just as there are jolts when rock drags atop or beneath other rock layers. Some major quakes have occurred in stretch zones, with the New Madrid adjustments in 1811-12 standing as an example. The greatest quakes occur where one plate is pushing under another. The Central District of Russia is not a quake prone region, in fact have almost no quakes of record at all. We have stated that a new seaway will form, running up into Russia from Pakistan during the hour of the pole shift, which will be the major rip point in the Eurasian Plate. Moscow, and its environs, will be flooded, but other than the devastation of the pole shift quakes, which will be magnitude 9 everywhere, should not anticipate great quakes. Can the Zetas follow up on or share human and ET reactions to STO ET interventions and warnings: Russian cargo ship/rocket take-down (and possible, resulting evacuation of the International Space Station) and the Comet Elenin assisted break up? [and from another] http://www.zetatalk.com/ning/27ag2011.htm After 43 successful launches of the Progress, what went wrong on the 44th? Loss of contact was reported, after the rocket launched, which is indicative of an electrical problem. Did benign aliens interfere, in order to issue a message to those in the establishment that the Council of Worlds is not pleased with their continuing cover-up over the presence of Planet X? Do not the people of the world have the right to know what is in their future, if the elite know and are taking steps to ensure their own survival? Electrical failure is easy to arrange, and fatal for a rocket dependent upon electrical signals between launch stages. Those on the ISS should be brought home, and the cover-up put aside. To do otherwise is indicative of a highly Service-to-Self nature among the world's elite, who are not likely to do otherwise without inducements. [and from another] http://www.zetatalk.com/ning/03sp2011.htm But suddenly things changed! Tiny Elenin, nothing more than ice and dust, was not venting steam into a brilliant tail but instead steam explosions were pushing the snowball apart, disintegrating. Although it is quite common for comets to disintegrate when they draw near the Sun, Elenin was assisted in this regard. The Council of Worlds allowed an interference to put an end to the campaign, which was considered a direct assault on the people of Earth and their right to be informed and to take steps to save themselves and their loved ones during the coming passage. Increasingly, steps will be taken to expose and disarm the cover-up, with the consequences likely to be that an angry public is demanding the truth. Primarily, the establishment does not relate their failures to interference by benign ETs. Interference is obviously rare, in human history, as so many examples of disasters and brutality, man's inhumanity to man, exist. The Council of Worlds rules governing 3rd density worlds do not align well with mankind's own rules, and thus it seems that no rules exist. In particular, the Rule of Non-Interference is not obvious to man. A schoolhouse where incarnated souls are allowed to make mistakes and learn from them, the full consequences of even the mistakes of others being allowed to play out, seems contrary to the image of a benign Council of Worlds. In man's 3rd density world, benign entities exhaust themselves trying to help others, else the entity is not considered benign and is rather looking out for themselves, solely. Thus the establishment does not entertain the possibility of selective interference by benign ETs. They assumed mechanical failure in the case of the failure of the 44th mission of the Progress rocket. It is the effect of this and possibly future failures that will convince them to vacate the ISS, a potential decision that has already been announced in the media. Since comets, especially new comets with no prior track record, are known to break up on approach to the Sun, this is the assumption for Elenin. On occasion, some members of the establishment may ponder a streak of bad luck, and wonder, but trying to bring forth the pattern for examination by others brings ridicule. While maintaining the Element of Doubt, this occasional interference means bad luck for the cover-up and good luck, on occasion, for those of good heart, the Service-to-Other humans struggling with the cover-up. During the recent annual Pacific islands forum being held in Auckland New Zealand, the discussions were dominated by political situation in Fiji and the threat of rising sea level to low-lying communities. It sounds like the sinking of some of these Pacific islands are serious and they need urgent help from the Pacific neighbours. Would the Zetas like to comment on the seriousness of the situations and what are the likely outcome or solutions discussed for all the Pacific neighbours? [and from another] Fiji, Climate Change Concerns Dominate Pacific Bloc Summit http://www.voanews.com/english/news/asia/east-pacific/ The president of Kiribati, Anote Tong, says his low-lying nation is being slowly engulfed as global warming lifted sea levels, forcing the government of the archipelago that straddles the equator to consider moving its 100,000-strong population onto man-made floating islands. [and from another] A series of mysterious deaths have been found on Fiji beaches. The local media have been warned not to report the deaths by a military regime concerned the negative publicity will spook tourists. Knowing that there were many earthquakes and many small scale of tsunamis happened around that region, I have good reason to believe that these deaths were caused by sea waves along the coast line of Fiji beaches. Is this an extreme case of media control by the Fijian govenment covering up the natural disasters caused by the tectonic plate movements? If this is indeed a cover up, Fiji being a member of the pacific neighbours, can we assume that the whole cover up networks include a lot more countries working together so that the common man is being kept in the dark of all earth changes within the ring of fire in the Pacific Ocean? [and from another] Fourth dead foreigner found in Fiji http://nz.news.yahoo.com/a/-/top-stories/10246366/ A young Japanese student has been found dead in a swamp in Fiji, becoming the fourth foreigner to die in strange circumstances in the tourist hot spot since June. Heavily constrained Fijian media, ruled by a decree not to publicize unfavorable news, did not report the incident until this week. Three other foreigners, two New Zealanders and an American, have died in unusual circumstances in recent months. Blog site Coup Four and a Half claims local media have been warned not to report the deaths by a military regime concerned the negative publicity will spook tourists. This question is essentially whether disappearing tourists were murdered due to Fiji sinking, to suppress this information from the world at large, or whether the media suppression is merely to protect tourism business. Fiji is sinking, but not to the extent where tourists would be discouraged or even notice, at present. Islands in the South Pacific, including Fiji, will not sink entirely until closer to the time of the pole shift, though the 7 of 10 has started this process. When tourists are murdered and robbed in Fiji, these crimes are not allowed to be recorded as such nor reported in the media, as the current military dictatorship in Fiji wants the cash flow that tourism brings to continue unabated. The Zetas said that due to PX's North Pole heading towards the Earth, we can expect weather cooler then normal in the northern hemisphere. That was the case from the beginning of the year, at least here in southeastern Europe, where northern wind was blowing almost every day and it was much colder than usual, even during the summer. At the beginning of the August, the weather pattern changed and now we have southern wind every day and it is warmer then in the middle of the summer. Can the Zetas comment this, has something changed on the Planet X's path? There are two factors affecting European weather. One is whether the globe is leaning its N Pole away from the hosing of magnetons from the N Pole of Planet X, or leaning temporarily into opposition, pointing its N Pole toward the Sun. The second factor is the wobble, which has become more violent of late, and will increasingly do so as Planet X bores outward toward the hapless Earth. The traditional Figure 8 wobble pattern, in place since early 2004, has the N Pole leaning into the Atlantic when the Sun is over Europe, at noon. This swing would of course pull Europe during the day under the atmosphere that had been warmed by lingering over the Gulf Stream, warm water from the Equator, which would bring Europe warm air. The traditional Figure 8 wobble likewise has a strong push away of the Earth's magnetic N Pole when the Sun is over New Zealand or the central Pacific, which is the middle of the night in Europe. This likewise is a push of the land under the atmosphere that had been lingering over the warm ocean waters, once again bringing Europe a warmer night. But what happens when the Earth temporarily swings into opposition, attempting to point its N Pole along the magnetic field lines of Planet X such that its N Pole is pointing toward the S Pole of Planet X? Opposition allows the magnetons to flow from the N Pole of Planet X through the Earth using the Earth's S Pole as an intake and thence on to the S Pole of Planet X. In this case the N Pole of Earth is not pushed away, daily, with the force present when the Earth is attempting to lean its N Pole away. More heat is over the ice fields of Greenland and the Arctic, so colder water flows down along the European coastline, thus colder weather in Europe. Such a lean into opposition would also place the Sun too far to the North, which had been noted of late on various message boards. - 1 billion or so incarnated by terran born souls, which break down into 25% Service-to-Other, 7% Service-to-Self, and 68% undecided. - 1 billion or so incarnated by souls born elsewhere, assisting in the Transformation, in other words, Star Children. - 4 billion fogged potentials, dazed and gap-mouthed, trying to sort out the world on their first tour. [and from another] January 16, 2010 http://www.zetatalk.com/index/zeta557.htm The Earth currently has 6 billion humans, of which only a billion have reincarnating souls. The rest are unlikely to spark a soul. Of the billion, 7% or so are Service-to-Self and will not be incarnating on Earth but will be taken to prison planets for their next incarnation, unless removed in human form to their new homes prior to the end of this incarnation. Of the billion, 30% or so are Service-to-Other and will be incarnating into hybrid bodies which we can produce rapidly, as incubation is assisted artificially so carrying to term in the mother is not required. The remainder of the billion are undecided and will go to a water planet for their next incarnation, and octopi have many eggs. [and from another] Is there a way to tell the difference between an STO terran-born and a Star Child? Both are STO, so perhaps it's very difficult to differentiate between them. I ask not out of simple curiousity. People are in the process of finalizing their survival groups, and after the PS will be needing to defend what they have. It would be a relief to be able to know how to tell for sure (if that's possible) that someone was a Star Child, because that person could then be totally counted on without further concern. The Star Children are all STO's from 4th density or higher and have simply had more time to solidify their orientation decision. Even a highly STO terran-born is still only 3rd density, and could be more subject to wavering under the pressures of the times to come. Also, as the Zetas have said, there are STS's that can put on a great act, and in the midst of the chaos could infiltrate their way into a good-hearted group thereby "contaminating" it. If there are ways to help identify a Star Child, especially because things may be happening quickly, that would be a very helpful thing to know. Have the percentages changed much since first announced in 2002? At that time, we declared of the approximately 1 billion terran born reincarnting souls that 25% were Service-to-Other, 7% were Service-to-Self and 68% were undecided. We also stated, in 2002, that approximately 1 billion incarnated Star Children were present, with the remaining 4 billion humans having unsparked souls. By 2010 this had not changed, except that the 25% terran born Service-to-Other soul percentage had move up to 30%. Why this change? This 5% uptick does not reflect decisions made, but Service-to-Other souls between lives being allowed to incarnating quickly on Earth, as they were clamoring for the opportunity to make a difference during the Transformation. We have detailed the complexity of the Star Child population, where these souls come from a varied backgrounds, having evolved from many different life forms, and choose their own missions. They do not operate as one, with any kind of coordination among the billion incarnated Star Children present. Given that 1 out of 6 humans is a Star Child, it would seem that most humans have encountered one, or may even have a family member that is a Star Child. However, there is no rule that Star Children must spread themselves evenly, and in fact an uneven spread is more likely to be the case. They chose incarnations where they can make a difference, in war torn areas, or in the halls of power. Obama is a Star Child, as was Ghandi, but most often a Star Child will not be in the spotlight but play a supporting role. Those trying to identify a Star Child from the population will be disappointed, as their most distinguishing characteristics is that others cannot quite understand their agendas. This is not a public issue, with hand-wringing and loud wailing, but rather a matter the human incarnated suffers silently. The Star Child might be quiet and well behaved, independent minded, while taking a support role that does not draw attention to the self. We have mentioned that Star Children are likely to have a well developed sense of outrage over the actions and in particular the intent of the Service-to-Self, whom they are adept at recognizing. But for the human population at large, this is often interpreted as a fault, not insight, with the Star Child blamed for having an erratic temper. Since erratic tempers exist, and certainly will exist during the tense times ahead, and since the Service-to-Self often mask themselves with good intentions, it will be impossible to establish a rule whereby Star Children can be identified. This story seems a little bit suspicious to me and personally along with the extent of the coverup I know NASA stands for "never a straight answer". As being currently apart of 7-10 I know moving forward that Satellite failure and loss of control of equipment will become more frequent. There is a quote from NASA which states: "NASA officials say there is a 1-in-3,200 chance that a piece of UARS satellite debris could strike and injure a person on the ground" I personally don't remember a time when there was "supposedly" a dead satellite falling to earth where stated was a chance could injure people. What is the truth behind this and might this be the "type" of story to be used to cover when the debris-filled tail of Planet X affects the Earth in a more massive extent? http://www.youtube.com/watch?v=pRF93Nlem8E [and from another] Dead Satellite Will Fall to Earth By September's End, NASA Says http://www.space.com/12928-falling-satellite-crash-late-september-nasa.html http://www.ibtimes.com/articles/213066/20110913/nasa-falling-debris-space [Sep 13] The spacecraft, an old NASA climate probe called the Upper Atmosphere Research Satellite (UARS), was decommissioned in 2005 and has been slowly losing altitude since. Soon, the 6 1/2-ton satellite will make a final uncontrolled plunge through Earth's atmosphere. [and from another] NASA states that sats could be out "for weeks" after electromagnetic activity. This looks like lining their excuses up ahead of satellite failures. [and from another] Mega Space Storm would Kill Satellites for a Decade http://www.newscientist.com/article/mg21128294.300 [Sep 13] When the sun belches a massive cloud of charged particles at Earth, it can damage our power grids and fry satellites' electronics. But that's not all. New calculations suggest that a solar megastorm could create a persistent radiation problem in low-Earth orbit, disabling satellites for up to a decade after the storm first hit. What does it mean that NASA emerged with two different excuses for satellite failures and debris from the tail of Planet X, both dated the same day, September 13, 2011. In addition to the "mega space storm" hypothesis, we are reminded that mankind's satellites die and crash to Earth. Debris from the tail of Planet X is to be assumed to be satellite debris, or so NASA hopes. Suddenly there are warnings from NASA that mankind's satellites might all go kaput, all due to the Sun, a solar flare. Satellite failure is something we have been warning about since the start of the ZetaTalk saga in 1995. Have they suddenly started taking the ZetaTalk message seriously? That both these articles emerged on the same date shows that NASA is trying to use media access to foist their lies on the public. NASA is a pawn of the establishment and as such lies to the public about the approach of Planet X, which has been in the inner solar system since 2003, per our predictions and per the extensive documentation on the ZetaTalk website. The establishment struggles with how to lie most effectively, and likes to get out ahead of the Earth changes we have predicted. Now that their lie about the comet Elenin has been taken from them, they cannot have their pawns blaming Elenin for all the Earth changes anticipated to be unfolding in the near future. What to do? They are returning to blaming the Sun, an old favorite, with a hypothetical "mega space storm" that would kill satellites for a decade! Has such a storm ever occurred? No, but as long as NASA has an credentials with the public, they can lie freely and hope to get away with it. The Zetas have said that the 7 of 10 will receive acceleration at some moment, and timeline will be overtaken. Here my Q is, what should occur that it could begin acceleration? Yes, I understand that the Sunda Plate, the Philippine/Mariana Plates till now in movement, and termination of their adjustment is point for acceleration, perhaps? But seems that here maybe there is something yet? Of course, I also understand that the Zetas can't tell more than is allowed. Although we have sequenced the 7 of 10 scenarios, there is great interplay between the scenarios. What has occurred to date is that India tilted sideways so that its western border lost 10 feet in elevation along the Indus River valley. This occurred first, in the Fall of 2010, and was followed promptly on December 23, 2011 by the start of the sinking of the Sunda Plate holding Indonesia. The third scenario was the folding of the Philippine and Marian plates, which was evident by February 16, 2011 from heaping water recorded by buoys in the area. India meanwhile continued its dive under the Himalayas, so that Pakistan and Bangladesh are now being inundated with sea water, and the eastern coast of Australia and New Zealand has frequently shown evidence of lifting, with rivers backwashing inland. India's dive will continue apace, throughout, and is not a 7 of 10 scenarios, per se. Did the sinking of the Sunda Plate complete, just because the Philippine and Mariana plates started folding? We have stated that the Sunda Plate will complete its sinking by the time the S American roll is at its peak, but not before. The folding of the Philippine and Mariana plates also must be almost complete before the S American roll can accelerate. And all of this has been held back to date by plate undulation which caused plate jamming such that there was a temporary delay in Asia. Northern Luzon island in the Philippines seemed exempt from flooding earlier, as it lay on the Philippine Plate, but recently has begun to sink along with the rest of the Philippine Islands. The Philippine Plate is obviously no longer jammed. Meanwhile, the Pacific has been compressing, though this was not given a 7 of 10 scenario number because it is a chronic situation, contributing to the plate movements but not central to the plate movements. So during the 7 of 10 scenarios in Asia, number 1 (India tilt) has completed, number 2 (Sunda Plate sink) began and is poised to complete, and number 3 (Philippine Plate fold) has barely begun. Number 3 is likely to complete hand-in-hand with number 2 rather suddenly at a time when the Indio-Australia Plate lifts and plunges under the Himalayas. This would be at a time when the Earth wobble switches about violently. The Earth is in a magnetic dance with Planet X, which is causing it to switch into opposition at times, pointing its N Pole at the Sun, then suddenly back to attempting to hide its N Pole from Planet X. Scenario number 4, the S American roll, has been evident since early Spring, 2011 with crumbling along the North Andes fault line and pressure along the spine of the Andes. This will peak during the time when the Asian scenarios are completing, almost hand-in-hand. We are not allowed to give a timeline on how quickly the African Plate's drop will follow, nor how quickly adjustments in the Northern Hemisphere will follow this drop. Why is China dumping $1billion in the Caribbean? Is this "hush money" regarding earth changes? Given their history, this kind of investment seems unusual. And the US is investing there too, at a time when we can hardly afford it. [and from another] http://news.caribseek.com/Trinidad_and_Tobago/article_99560.shtml PM Spencer and his CARICOM colleagues along with China's Vice Premier Wang Qishan during the Opening Ceremony of the forum in Trinidad and Tobago. Prime Minister commends China for 1 billion-dollar support to the Region [Sep 14] Vice Premier Wang Qishan said that in the next three years the Chinese government will execute a number of policy measures to deepen cooperation with Caribbean countries. [and from another] http://news.caribseek.com/Guyana/article_99607.shtml Guyana stands to benefit as China pledges US$1 billion loan to Caribbean countries to aid economic development [Sep 14] The Asian giant will also help build an early warning monitoring network for earthquakes and tsunamis and provide training for disaster reduction and prevention. [and from another] http://news.caribseek.com/Caribbean/article_99524.shtml MIF launches initiative to reduce the impact of climate change for microenterprises in the Caribbean [Sep 14] WASHINGTON, DC, U.S.A. (IDB) - The Multilateral Investment Fund (MIF), of the IDB Group, is investing US$1.5 million to launch a pioneering initiative that will help coastal communities and micro and small companies in the Caribbean to fight the impacts of climate change. The US is investing a mere $1.5 million and China can certainly afford to continue its investments in the Caribbean and Guyana with an additional $1 billion. The relevant issues are the focus of the bequests. The "impacts of climate change" and "early warning" for "earthquakes and tsunami" are specifically mentioned. The forum was held in Trinidad and Tobago, at the heart of the sinking to occur during the S American roll. This is at base an attempt to control the local media, to put the right spin on the anticipated sinking. It will be "earthquake tsunami", not the ZetaTalk predictions, and no mention of the flooding failing to drain. When the failure to drain becomes obvious, then it will be "climate change" with rising seas. Considering what the establishment in both countries stands to lose with a premature break in the cover-up, this is indeed considered a good investment! Can the Zeta's also commented on the degree of completion of the sinking in the affected areas in the progress of the 7/10? There are numerous reports of flooding in Pakistan, India, Thailand, Indonesia etc. usually attributed to rain although lately there has been more mention of sea erosion, subsidence, sea infiltration and flooding failing to recede etc. Obviously there are challenges for us to discern what flooding is being caused by sinking, rains, rogue tides or combinations of all with the force of the cover-up in progress. It has been 3 months since we were asked about the cover-up in the Asian media, and suppression in the word-wide media as a result. The sinking on the Sunda Plate is not called that, it is rather called flooding due to rain, or erosion of seawalls, or high tides with slow drainage. Certainly any investigative reporting that was begun was quickly snuffed, with death by accident or suicide threatened unless the reporter cooperated. When the sinking on the Sunda Plate completes, there will be cities such as Singapore and Jakarta affected to a degree that it cannot be denied. This is also likely to happen fairly abruptly, in step with the S American roll peaking and GPS malfunctioning, so will be hard to keep out of the media. Excitement tends to cause talking head to blurt out the facts and panic tends to cause editors to be distracted from their normal review of what is to be broadcast. This will be followed quickly by pre-packaged nonsense excuses, primarily by NASA guests and well rehearsed geologists and oceanologists. We predict a fairly rapid erosion of support for the official explanations, primarily due to a vast and well versed public aware of our predictions and track record. ZetaTalk has been around since 1995, with a consistent message and a phenomenal track record. During any shouting contest when the Earth changes pick up, along with signs in the skies, it will be the ZetaTalk fans who hold the best ammunition and thus they will win, convincing the crowd listening to the contest. Those seeking the ZetaTalk information will find the mirror sites well exercised, a wise investment in time and energy by the Mirror Site Team. The public will pour into the ning in phenomenal numbers, such that the moderators are suspending troublesome posters without delay and not bothering to explain their actions. This time is coming! For the new jobs bill that Obama is promoting, he is arguing that we need to increase tax to the rich now in order fund infrastructure maintenance and hence boosting employment and he quoted " Why wait for another bridge collapse?" It sounds like Obama has been reading zetatalk and he is expecting bridges to collapse in the event of new madrid adjustments or could this be his way of warning people that bridges will be falling? Is he taking a risk here in his political career before the next presidential election? 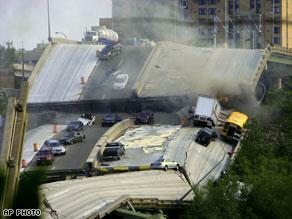 http://politicalticker.blogs.cnn.com/2011/09/15/obama [and from another] Obama: Why wait for another bridge collapse? http://content.usatoday.com/communities/theoval/post/2011/09/obama [Sep 16] President Obama has a new argument for his new jobs bill: Prevent another bridge collapse, as happened in Minneapolis in 2007. What made Obama chose the 2007 collapse of the Minneapolis bridge on I-35 as his example of infrastructure needing to be repaired? This was of course a dramatic incident, with the bridge flinging to one side and folding in waves against that side. Clearly there was tension, the Mississippi pulling apart at that point. This is also an incident that got a lot of attention on the Internet for a ZetaTalk prediction come true. We had predicted Mississippi bridges ripping during the New Madrid, and this was the first example of this prediction culminating. Curious minds, entering the date and place into search engines, would arrive at the ZetaTalk predictions. Is this Obama's way of leaking the truth? Yes, and just the start of such maneuvers.